Commercial and house removals Pershore is our speciality. Need Pershore Removals and Storage? Moving locally in Pershore, or further afield? As members of the BAR we can offer you a safe, secure moving service with all the benefits of being a family run removal company started over 30 years ago. We can help with all your moving house needs and if you need extra services, we will have an option to suit your requirements - contact us today. 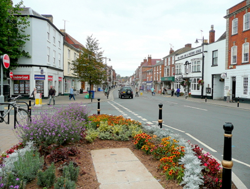 Pershore High Street and Broad Street intersect in the middle of this busy market town. Surrounded by the local villages of Elmley Castle; Cropthorne; Wick; Peopleton and Drakes Broughton. The Angel Inn, a posting house for mail coaches in days gone by, dates back to Tudor times and would’ve received much custom as this was then the main road from Worcester to London. Whether you are moving locally in Pershore town or across the Three Counties, UK or even internationally we will have a moving solution to meet your needs. We can tailor our service from a direct removal service only, to providing a part or full specialist packing service ensuring a smooth, efficient move to your new home. Need short term storage in Pershore area?